1. How is circRNA generated? 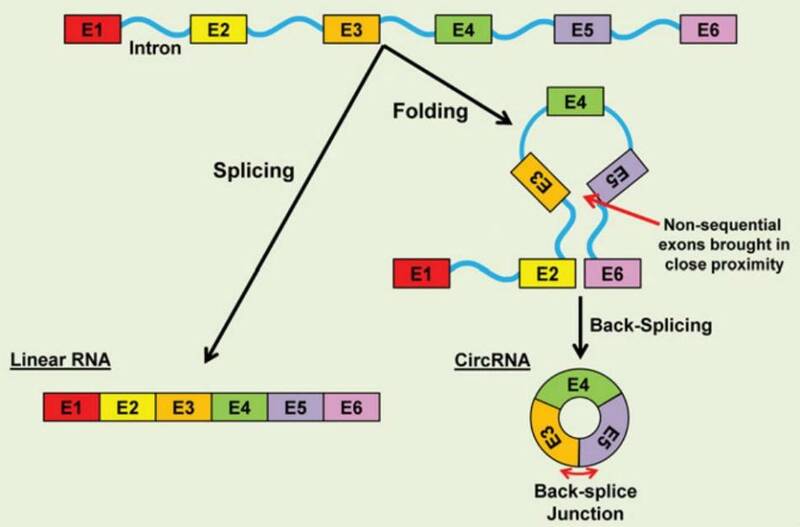 CircRNAs are generally generated through the back-splicing of exons in a non-sequential order. Circularization of RNA can be generated by repetitive sequences to facilitate the back-splicing of non-sequential exons. Figure 1. CircRNA biogenesis (Fischer & Leung 2016). 2. Why using high-throughput technology to analyze circRNAs over microarrays? High-throughput sequencing is a time and cost saving method with many advantages over DNA microarrays. i. Detection of novel transcripts. Microarrays depend on the hybridization with species or transcript-specific probes that are restricted to known circRNAs. However, RNA sequencing can detect novel transcripts, gene fusions, single nucleotide variants, small insertions and deletions, and other previously unknown changes. ii. Broader dynamic range. Microarrays are limited by background at the low end and signal saturation at the high end, while RNA sequencing can quantify discrete, digital sequencing read counts, offering a broader dynamic range. iii. Increased sensitivity and specificity. Compared to microarrays, RNA sequencing offers increased sensitivity and specificity, enabling enhanced detection of genes, transcripts, and differential expression. iv. Detection of low-abundance and rare transcripts. Sequencing coverage depth can easily be increased for detection of rare transcripts, single transcripts per cell, or weakly expressed genes. 3. Are there any tips for constructing circRNA expression vector of circRNA? Yes. Sequences for circularization and sequences that activate the circularization are required to construct circRNA expression vector carrying circRNAs. Fischer J W, Leung A K L. CircRNAs: a regulator of cellular stress. Critical reviews in biochemistry and molecular biology, 2017, 52(2): 220-233.